With the launch of Apple's new iPad out of the way, it's time to look ahead to the next big tablet launch on the horizon. I'm talking about Windows 8, whose late 2012 launch should be backed by a wave of new tablets and tablet-laptop hybrids. Although we haven't heard much about Windows 8 tablets yet, some pieces of the puzzle are starting to come together. 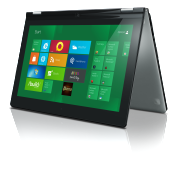 At CES, Lenovo showed off a Windows 8 tablet-laptop hybrid called the IdeaPad Yoga. 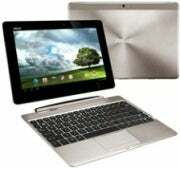 The device's 360-degree hinges allow it to fold all the way back from laptop position into a tablet, with the keyboard disabled on the rear panel. An unnamed source told The Verge that Lenovo will be first to market with a Windows 8 tablet, using an Intel chip -- the same as the Yoga. The source didn't have any other details on the tablet itself, so it's not clear whether the Yoga will be Lenovo's first Windows 8 slate. Dell hasn't gone into specifics, but the company is likely to focus on tablets for enterprise users. “Having a secure Windows tablet that works with all the Windows applications -- we’re hearing a lot of demand for that and we think that will be quite attractive,” Dell says. Microsoft has been using a modified version of Samsung's Series 7 Slate to show off the Windows 8 Developer Preview and Consumer Preview to the press, it's no surprise that Samsung is working a commercial Windows 8 tablet. Uhm Kyu Ho, head of Samsung's PC business, said last November that the company is working on a product for release in the second half of 2012. It'll likely be similar to the Series 7, he said, although an upgrade to Intel's Ivy Bridge chips would be nice. Asus confirms that it's cooking up a tablet running Windows 8 on ARM, but that's all we know for sure. Last year, there was an unconfirmed report that Asus will use a design similar to its Transformer tablets, which would certainly be welcome for users who want a slim tablet and a small laptop in one package. Both the current Transformer line and the PadFone Asus introduced recently at the Mobile World Congress run on the Android operating system. With WebOS on the open source backburner, HP is turning its attention back to Windows. CEO Meg Whitman says she expects to have an Intel-based Windows 8 tablet out this year. Nokia's design chief Marko Ahtisaari has confirms that the company is building its own tablet, and given Nokia's partnership with Microsoft, the tablet is likely to run Windows 8. DigiTimes has reported that the tablet will have a ten-inch display and run on a dual-core ARM-based processor, but that's the only specific tidbit we've gotten so far. Follow Jared on Twitter, Facebook, or Google+ as well as Today @ PCWorld for even more tech news and commentary.